My son is (& has always been) a very strong-willed, determined boy. He is kind, he is patient, & he is respectful; but he is also very logical, inquisitive, & determined. From a young age, people would comment about how he is a “little lawyer” who could get them to come around & see his side of the debate. I learned fairly quickly that if I had a good reason for the things that I was asking him to do, he would happily do that. If he saw something as pointless, or if he had a better way of doing things, he would fight for his opinion endlessly. So instead of turning each day into a power struggle, I reflected on things a bit… The conclusions that I came to are things that I think can be beneficial to any parent/child relationships regardless of the age of the child or their personality type! I should have well thought out reasons behind my rules. I should take the time to explain my reasoning to my children. When my son was upset that he had to go to school 5 days a week, but his little brother only went to preschool 2 days a week, I explained how it is a law that children who go to public school have to go 5 days a week. I explained that we could get in trouble if he missed too many days of school, & I explained that when his brother gets to be his age, he will also be going 5 days a week. My son had drawn the conclusion that I was choosing to send him 5 days a week. That it was me trying to get a break from him. That I could keep him home, but I just didn’t want to. This was causing a riff in our mother/son relationship, & I was seeing him act out behaviorally because of this. It was so important for me to be able to explain that I love him, I love spending time with him, & that we are simply following someone else’s rules. When we would be heading out the door, & my son needed to put his shoes on… I didn’t always feel like explaining why he had to wear shoes. However, taking the time to logically explain the reasons that we wear shoes (so we don’t step on anything ouchy, so our feet don’t get cold or dirty, because stores require us to wear shoes, etc) prevented future battles over the same issue. The more that you explain your reasoning, the more it becomes a habit. It is now second nature for me to be thinking through my “why” before asking something of my children. And on the other hand, my children learn the reasons behind the rules so that there doesn’t have to be an explanation every time! I should be grateful that my children stand up for themselves. 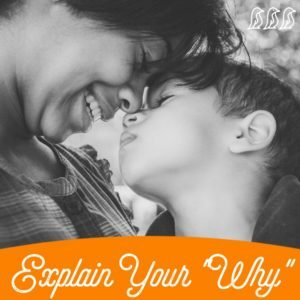 A big reason that I take the time to explain my “why” to my children is that I want them to be able to make decisions for themselves. I won’t always be around to tell them what to do. Giving them a glimpse into my thought processes allows them to learn to make similar decisions for themselves. It allows them to be more independent, gives them leadership skills, & builds confidence. There are many rules that exist for the well-being & safety of themselves & those around them. I want my children to understand the gravity of those rules, & the risks of breaking them. However, I don’t want my children to blindly follow the rules. As they grow up, they will be surrounded with more & more people (aside from their parents) that will be telling them what to do. These could be ill-intending peers or adults, & I don’t want my child to simply obey for the sake of obeying. I want my children to know their own “why” behind their actions so that they can thrive in their own unique way.